First, this post is not sanctioned by DEF CON in any way. I am a member of the CFP team who decided to keep some rudimentary statistics on the submissions this year, as I did last year. I did this to give the team a feel for just how many submissions we got, how many talks we accepted, and primarily to track the way we voted. This greatly assists the powers that be (the amazing Nikita) to more quickly determine which talks are well-received. Due to time constraints, I was not able to track as much metadata, so this blog will be shorter than last years. A recurring theme in these blogs and our Tweets throughout the CFP process is strong encouragement to submit early. 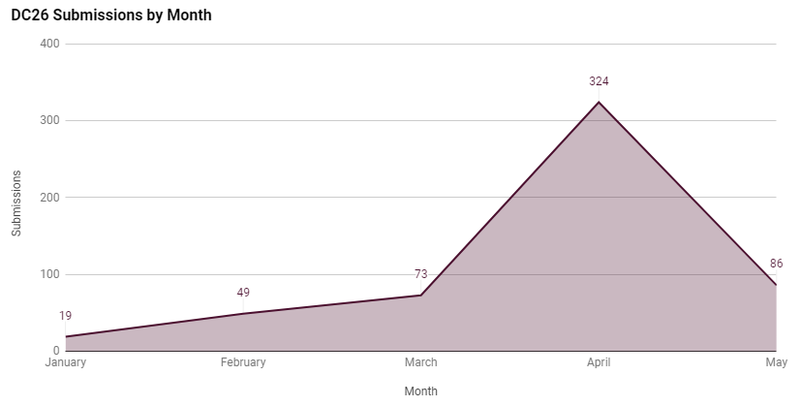 While we did get a share of submissions in January and February, you can still the huge spike we experience in April (a majority a day before CFP closed), and May (on the day it closed). The two weeks between the end of CFP and the time when acceptance/rejection letters are sent out become stressful as we’re under deadline to review talks, try to get last minute feedback when we can, and make final decisions. Of the 551 submissions, 107 were accepted (19.4%). 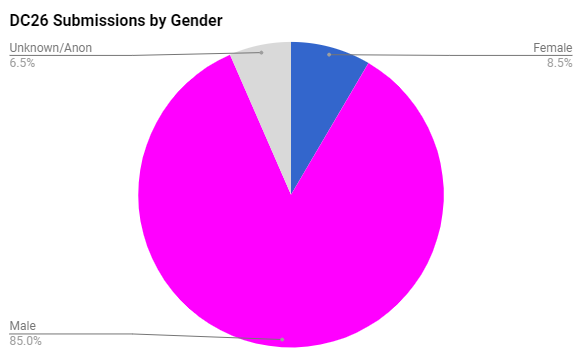 There were 388 unique male submitters, 39 unique female submitters, and 14 anonymous submissions (note: we only catalog based on the gender, if known, of the primary speaker). Of those 14 anonymous submissions, 3 were trivially identified because the submitter didn’t scrub their submission properly or submitted work that had been presented before and was caught with a quick Google or Bing search. Of the 551 submissions, 173 (31.40%) said they would release a new tool. 77 (13.97%) said they would release an exploit, up from 56 (10.53%) last year. Of all the submissions, 216 (39.20%) were also submitted to Black Hat and 51 (9.26%) said that speaking at DEF CON was contingent upon Black Hat accepting their talk. 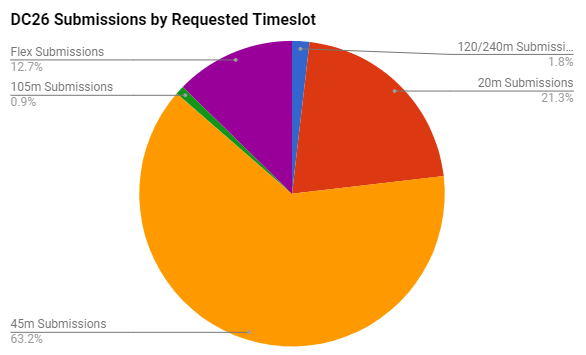 Only 73 (13.25%) submissions were also submitted to BSidesLV. Of the 551 submissions, 122 of the speakers had presented before at DEF CON, and an additional 28 had presented before at a DC Village or Workshop. Unfortunately, time did not permit me to properly track ‘red’ vs ‘blue’ vs ‘black’ submissions, nor categorize the talks. That said, 11 talks were about ‘Artificial Intelligence’ and/or ‘Machine Learning’, even if some of them didn’t quite seem to know what those terms really mean. Ten submissions were on the topic of, or heavily related to, blockchain. Eight submissions came with the ultra creative title that included “for fun and profit”, four included “all your $blah belong to us”, two submissions used “pwned” in the title, and fortunately for our sanity, none wanted to make $blah great again. That’s it! I realized this is a bit more brief than last year, but the time requirement of reviewing all of the submissions is crazy. Finding extra time to maintain the sheet is rough, and generating even more statistics or tracking additional metadata just can’t happen sometimes. Fortunately for me, this year Highwiz stepped up and did an incredible amount of work filling in data, especially while I was lost in the mountains for a few days.